Seasonal Mass Snake Migration in Sinks Canyon. Thousands of snakes moving in packs of two to nine. Dangerous and extremely aggressive! Known to swarm. Have cut dogs to pieces and disarmed people swinging shovels at them. Reminds me one of a Hanson's favorite spots. Uh, hey Moose . . . different pictures of swarming snake dens will look very similar. Just because you did a quick bit of "research" and found another similar photo of snakes in Arizona doesn't mean this isn't a legitimate Wyoming photo. IT IS LEGITIMATE. 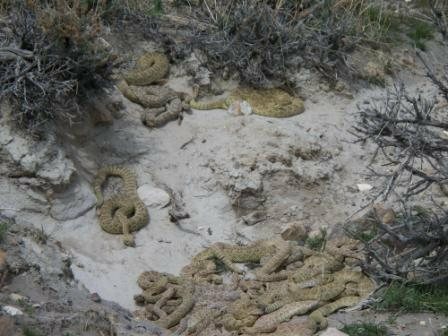 These snakes were swarming out of their den IN WYOMING.